Dublin retained their Football League Division One title as their power and pace proved too strong for outclassed Derry in the final at Croke Park. Cailean O'Boyle's early goal put Derry ahead but the Dubs responded to lead 0-13 to 1-3 at the interval. Derry had a penalty appeal dismissed but Dublin missed several goal chances. Bernard Brogan hit a stunning second-half goal as he finished with 1-6 with Kevin McManamon and Diarmuid Connolly netting their other three-pointers. Man of the match Brogan was making his first start of the league campaign and was well supported in the Dublin forwards by his playmaking brother Alan plus man-mountain Eoghan O'Gara, who tormented Chrissy McKaigue. Mark Lynch, so outstanding during Derry's campaign to date, was dominated by Johnny Cooper in the crucial first half and while the Banagher man did improve significantly in the second half, the damage had been long done for the Oak Leafers. Sean Leo McGoldrick's absence because of injury didn't help Derry's chances but it's highly doubtful his presence would have significantly altered the end result, such was the gulf between the teams. O'Boyle's fourth-minute goal was set up by Emmett McGuckin but the Dubs were on terms by the seven minutes and O'Gara's first point gave the All-Ireland champions a lead which they never relinquished. Despite missing several glorious goal chances, the Dubs moved into a 0-9 to 1-0 lead by the 20th minute with O'Gara and Bernard Brogan causing massive headaches for the Derry defence. 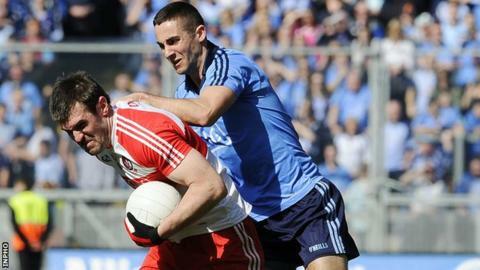 Derry could point to having their penalty shout turned down when Lynn appeared to be pushed over although such was Dublin's ability to attack at will, it's doubtful that another Oak Leaf goal would have had much impact on the contest. Derry's best first-half attacker McGuckin finally managed another Oak Leaf score and they did waste another goal opportunity just before the break after Emmett Bradley's stray pass when the Dublin defence was stretched. Seven points down at the break, Derry briefly cut the margin to five after Gerard O'Kane and Lynch efforts, and the latter's score probably should have been a goal as his shot clipped the crossbar from close range after a dreadful Cooper pass in midfield. But within 90 seconds the game was over again after Paul Flynn's towering third point was followed by Brogan's stunning goal as he unleashed a 25-metre shot past brave Derry keeper Thomas Mallon. Lynch went close to notching a second Derry goal on three occasions during the remainder of the contest but Derry were even more profligate at the other end as a series of bad misses brought up their wides tally to 16 by the end of the game. Substitute McManamon palmed in the All-Ireland champions's second goal on 57 with Connolly notching the third a minute from time as the Dubs secured back-to-back League titles for the first time in the county's history. Dublin: S Cluxton; P McMahon, R O'Carroll, J Cooper; J McCarthy, N Devereux, K Nolan; M Dara Macauley, C O'Sullivan; P Flynn, P Andrews, D Connolly; A Brogan, E O'Gara, B Brogan. Derry: T Mallon, O Duffy, C McKaigue, D McBride, K Johnston, G O'Kane, A McAlynn, F Doherty, P Bradley, E Lynn, M Lynch, C McFaul, B Heron, E McGuckin, C O'Boyle.